At the start of the season, Great Bend was ranked ninth in Class 5A and junior Drew Liles was fourth at 120 pounds. 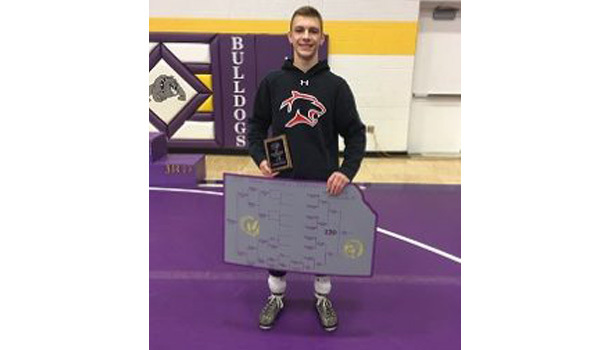 However, Liles is currently ranked second at 120 and GB has moved to seventh in 5A with coach Nathan Broeckelman, a successful wrestler at powerhouse Norton and former coach at Tribune-Greeley County. Liles is Great Bend’s highest ranked wrestler and enjoyed a big win last weekend at the Dodge City meet. Last winter, Liles took third at state at 113 with a 41-8 record and was the top finisher for GB. Liles was ranked fourth on Dec. 4 but then leaped to first in the Dec. 11 and Dec. 18 rankings. He currently only trails Newton’s Grant Treaster in the rankings. Liles is part of a highly talented junior class for the Panthers. GB won the Valley Center and Douglass tournaments and performed well at the Flatwater Fracas, a massive tournament in Nebraska. Last weekend, Great Bend had a high showing in the first annual Dodge City Invitational versus multiple highly ranked Class 6A schools. Manhattan won with 203 points, Dodge City was second at 176, Great Bend third at 158.5 and Garden City was fourth at 135.5. Manhattan, DC and GC are ranked 2-4-5, respectively in Class 6A. The seven-team tournament also featured Valley Center, Emporia and Gardner-Edgerton. Liles took second at 120 and moved to 17-5 this season. In a stacked four-wrestler championship bracket, he defeated Garden City’s Silas Pineda, 2-0, in the semifinals. Pineda (21-5) is ranked second at 120 in Class 6A. In the finals, Liles fell to DC’s Couy Weil, 4-3. Weil is ranked fourth at 120 in 6A. Additionally, Manhattan junior Tate Sauder, ranked fifth at 120 in 6A, earned fourth. As well, GB junior George Weber moved to 21-0 at 138 pounds. He is ranked fourth in 5A. In the finals, he defeated Dodge City’s Garrett Edwards, 5-1. Edwards is third at 138 in 6A. At 145, Panther junior Gage Fritz also collected a title and moved to 20-1. Fritz is ranked fifth at the weight class. He earned a 12-0 finals decision against Manhattan’s Darius Island-Jones, ranked sixth at 145 in 6A. Weber and Fritz are both returning state placers. Junior Alex Randolph (18-4) won the title at 152 and pinned G-E’s AJ Rodriguez, who is ranked fifth at 152 in 6A.